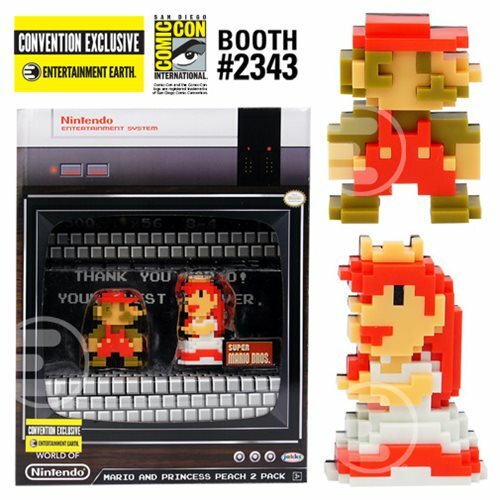 World debut of 8-bit Princess Peach mini-figure! Convention exclusive retro TV and NES packaging! Retro Nintendo Entertainment System 8-bit pixel figures! Entertainment Earth Convention Exclusive! You'll never have to worry about being told that "our princess is in another castle" again with the World of Nintendo Super Mario and Princess Peach 8-Bit Mini-Figures 2-Pack. Packaged in a box designed to remind you of the televisions of the 1980s, this nostalgia-fueled collectible set recreates the ending of one of the most influential adventures of all time - Super Mario Bros.. Each pixel-perfect figure measures about 2 1/2-inches tall and can stand freely or be displayed in this handsome packaging. The backdrop of the box was inspired by stage 8-4 of the original game, and we know you won't want to miss this amazing set of figures! Ages 3 and up.